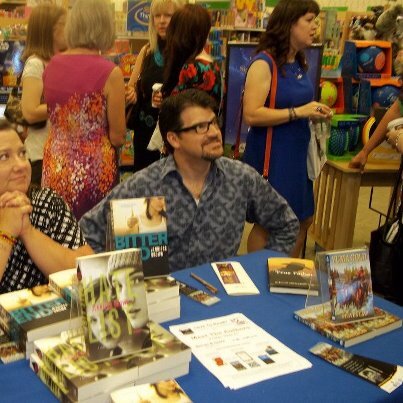 While I was attending ORACON this weekend (the Ozark Romance Authors' annual conference in Springfield, Missouri) I got to share a table with Jennifer Brown and Steven Anderson Law at the Barnes & Noble booksigning event. That's Jennifer and Steven sitting at the signing table. Jennifer has been a favorite of mine since a mutual friend recommended I read HATE LIST -- and I loved it. The subject matter is heavy, but Jennifer's treatment of the aftermath of a school shooting is compassionate, sensitive, and even upbeat -- without being Pollyanna-ish. The best thing about it is that there's not a single stereotypical character in the entire book. Nobody is predictable. Though I hadn't met Steven before, I was delighted to learn that he's a fellow Iowan at heart and he even attended the college that's less than a mile from my house. Plus I learned a whole lot about promotion and publicity from this talented guy. Great events sometimes come in small packages. ORACON is a one-day conference, but its impact on writers and readers is huge. Mark your calendar for September 21, 2013 -- the next ORACON!